While we’ve already started working on our New Year’s resolutions, we’d like to make a quick overview of 2018. We’ve embraced changes in the industry pushing for legal clarity and company transparency. Looking back, we have been releasing new feature updates at an extraordinary rate. By enabling cryptocurrency experts to share their knowledge on the ICONOMI platform, we are helping users enter the existing world of cryptocurrencies and teaching them new ways of investing. 2018 was a year of landmarks for ICONOMI, with the long-awaited release of euro transactions enabling users to buy into Digital Portfolios and individual cryptocurrencies directly with euros, a proof of solvency conducted by a Big Four professional services firm, the first stages of the eICN security token, and much more. In total, we completed 90% of features for Digital Portfolio Experts, 85% for users, and 81% for the platform. Users from countries not yet supported for euro transactions can use bitcoin and ether to buy into the eight other cryptocurrencies available for single purchase. In September, we announced the upcoming transformation of ICONOMI’s corporate structure facilitated by the eICN security token. 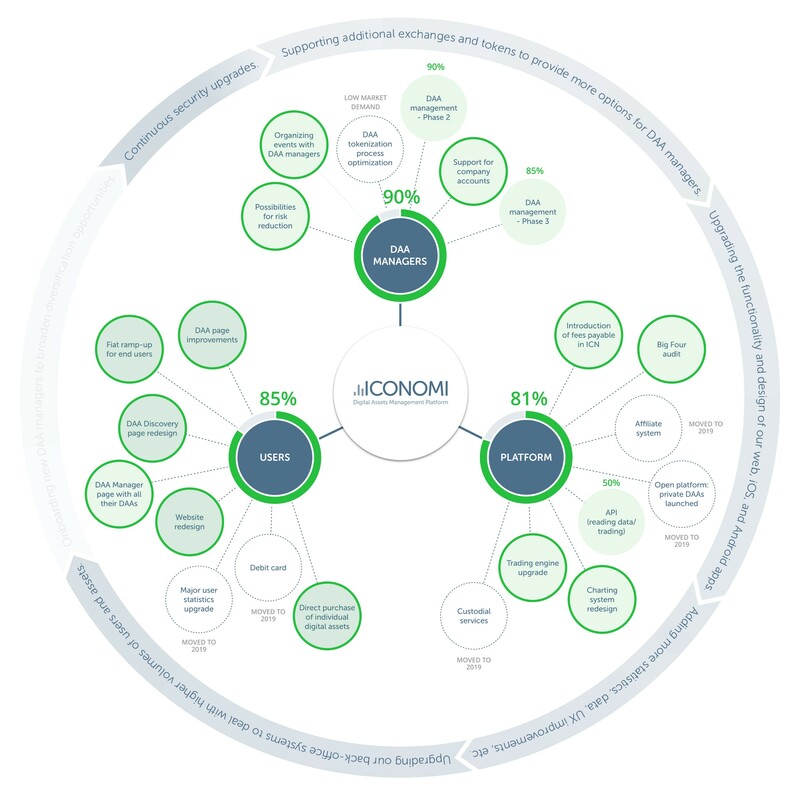 All holders of eICN will be entitled to common shareholders’ rights such as voting rights and the right to participate in the net profit of the company and will have the chance to actively shape the future of ICONOMI. For more information, read our Everything You Need to Know About eICN blog post. If you still have questions, read our FAQ Part I, Part II, and Part III. Our new explore page makes it easier than ever to browse through the 34 Digital Portfolios and 10 cryptocurrencies now available on the ICONOMI platform. In an ICONOMI landmark, April saw the completion of our proof of solvency by a Big Four professional services firm. An independent overview verified that all the digital assets on our platform have been reported accurately and that ICONOMI is solvent. On April 5, 2018, ICONOMI had $133.6M of liabilities and $210.2M of reserves distributed across 80 digital assets, fully covering all liabilities. The data is available directly on our website, and a technical overview of the process is available here. We released our new trading engine at the end of July. The new trading engine allows for faster and more robust processing, enhancing Digital Portfolios by allowing greater volume in a shorter period of time. For our cryptocurrency Experts, this means more active Digital Portfolio management and rebalancing opportunities. In January, we upgraded our identity verification system, expanding the number of supported countries to 181. The upgrade also allowed us to increase Tier 1 deposit and withdrawal limits, and Tier 1 verified users can now withdraw up to $50,000 per month. Check out other Tier limits and be sure to verify if you haven’t already! In May, we added TrueUSD as a supported asset on the platform. Access to a stablecoin allows cryptocurrency Experts to mitigate losses during times of high volatility. For example, if a market correction is expected, TrueUSD can be used in the structure of the Digital Portfolio to preserve its value. For users, the addition of a stablecoin to the platform allows for better management of volatility, which can result in more stable Digital Portfolios that our users can buy into. Throughout the year, we hosted Meet the Managers events in Vienna, London, Madrid, Amsterdam, Hong Kong, and Singapore. These events gave attendees the chance to interact directly with Digital Portfolio Experts and ICONOMI team members and learn more about the latest trends in the blockchain industry. Together we are on a mission to continue creating the best experience for our users and taking advantage of new opportunities in this exciting industry. We are also dedicated to accelerating the transition to the tokenized world, where we will witness real-world assets becoming digital tokens on the blockchain. This, we believe, will continue to be a major trend in 2019. We’re honored to have provided our users with a safe and easy way to invest in cryptocurrencies and will continue to improve in the year to come. Here’s to an even bigger 2019!